There is a really interesting website hosted by the Asian Christan Art Association which features various Asian artists. The featured artists include i) Ni Ketut Sri Wardani (Indonesia), ii) Kim Jae Im (Korea), iii) Hari Santosa (Indonesia), iv) Hanna Cheriyan Varghese (Malaysia), v) Geoff Todd (Australia), vi) He Qi (China), vii) Li Wei San (China), viii) Dr. P. Solomon RAJ (India), ix) Kang Joon-Ho (Korea), x) Shim Hyun-Joo (Korea), and xi) Wisnu Sasongko (Indonesia). Hari Santosa (Indonesia) is an Indonesian Christian artist and ACAA member live in Yogyakarta. In 1979 he established and organized 'Sanggar Melati', children art studio, which has accomplished various achievements in both national and international scopes. He seriously started painting in 1998. The pictures displayed on this gallery are some of his new paintings in 2001 and 2002. He Qi (China)is a professor at the Nanjing Union Theological Seminary and a tutor for master candidate students in the Philosophy Department of Nanjing University. 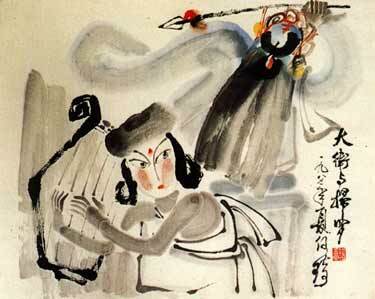 He is also a member of the China Art Association and a council member of the Asian Christian Art Association. He has been committed to the artistic creation of modern Chinese Christian Art for more then twelve years. He hopes to help change the "foreign image" of Christianity in China by using artistic language, and at the same time, to supplement Chinese Art the way Buddhist art did in ancient times. 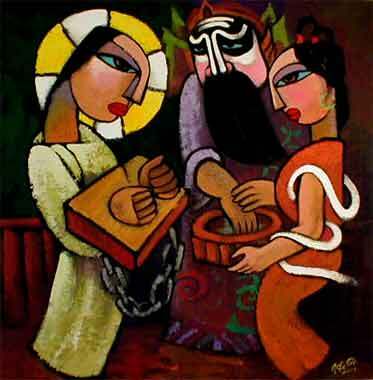 Pilate washes his hands Matthew 27:11-26 He Qi also has his own website where a lot of his works (including his most recent works) are featured. If you click on that link, you really won't be disappointed. He is my favourite artist for now!